It takes a little thinking to come up with a campsite meeting my Memorial Weekend criteria: probably not busy, easy to reach in our tiny car, not under snow (obviously), not a repeat of recent years, and geologically interesting. 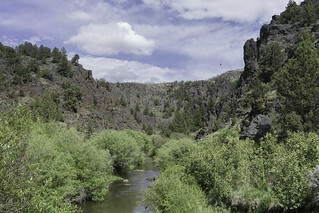 Our winner is the North Fork Crossing recreation area in the Idaho Owyhees near Oregon. I’ve only been there by motorbike and that several years ago¹ but it stuck in my mind as a place I’d like to explore.